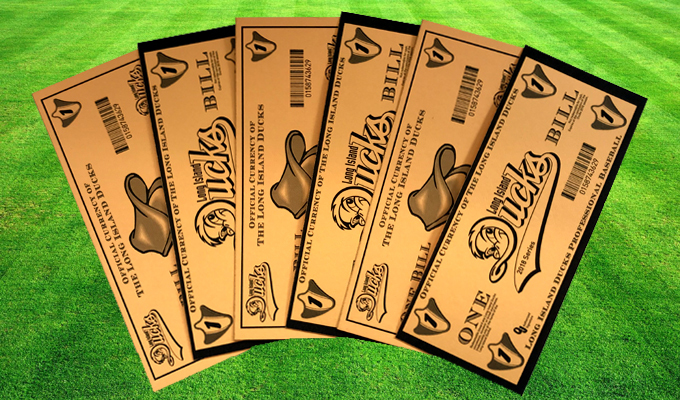 In lieu of gift cards/gift certificates, the Long Island Ducks offer fans the opportunity to purchase "Duck Bills". Fans can purchase Duck Bills by visiting the Bethpage Ballpark executive offices Monday through Friday from 9:00 a.m. to 5:00 p.m. Duck Bills can also be purchased from April through September at the box office, which will be open Monday through Friday from 10:00 a.m. to 6:00 p.m. and Saturday from 10:00 a.m. to 2:00 p.m.